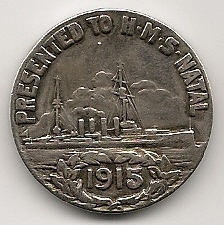 A rare survival of HMS Natal is the “Natal Medal”. This medal was not issued by any national authority but was created by the Canteen Committee of HMS Natal and was issued on the 30th September 1915, the 10th anniversary of the launch of the ship. It was seen as a memento of that event. Everybody who was on the ship’s books at the time was issued with one. During the early part of World War 1 each ship in the Navy and each regiment in the army was responsible for its own victualling and they all had canteen committees. These committees were better or poorer in organisation and resource. Indeed, there was such a disparity between units that the War Office and the Admiralty had some concerns that unrest could be caused amongst the men. This was not a problem in the pre-war days with the regular army and navy. But during the first years of the war the great recruitment of men straight from civilian life it was seen as a problem especially as many were members of trade unions. By the beginning of 1917 the practice of individual canteen committees had died out and the Navy and Army Canteen Board was founded to provide a uniform service across all regiments and ships. The Canteen Committee of HMS Natal was well endowed during the early years of the war. This was because the Province of Natal, in South Africa adopted her as their ship. This meant that “The good folk” of the colony provided generous monies for the comforts of the crew. There was a surplus of funds and the Canteen Committee decided to use the funds to create the medal. The medal is made of pure silver and has on one side a starboard view of the ship with the legend “PRESENTED TO H.M.S. 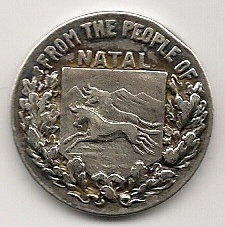 NATAL” and the date 1915. On the other side is the shield of the Colony of Natal between two oak branches, with the legend “FROM THE PEOPLE OF NATAL”. Around the edge the name of each recipient was engraved. As far as can be ascertained very few of these medals have survived. It is very likely that a large number of them went down with the ship on 30th December 1915, just 3 months after they were issued. Those that survived were either sent home by the recipients or were given to crew members who were transferred off HMS Natal before the explosion. The medal that is in the collection of Cromarty Courthouse Museum belonged to a sailor who was transferred to another ship in November 1915.